Built during the reigns of three kings—Sancho, Afonso III, and Dinis—the castle served as a frontier post against Spanish encroachment. Perhaps it is the namesake of the castle that deserves the most attention. Santa Isabel, who died at Estremoz in 1336, was 15 years old when she came to Portugal from Spanish Aragon as the bride of King Dinis. Shy and modest throughout the wedding festivities, she unexpectedly announced that she had invited all the poor of the town to be her guests, and moreover, that she would wash their feet and feed them bread with her own hands. She continued doing this every Friday during Lent for her entire life—as well as fasting, performing every religious ritual imaginable, and giving away most of her money to the poor. And she also managed to produce two heirs for the king. Dinis, who was not as interested in such intense devotion, produced seven illegitimate children by several different women. Isabel welcomed all of them into her household, educating and caring for them. Isabel was considered a saint in her lifetime because of the miraculous cures the sick attributed to her blessing. In the 15th century she was formally canonized Santa Isabel. 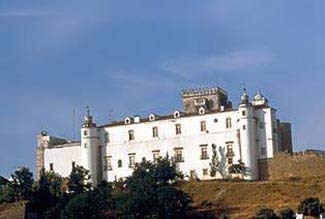 At the end of the 19th century, the palace at Estremoz was used as a military installation until an explosion destroyed much of the structure. The Portuguese government restored a great portion of the building. The town of Estremoz can be seen in an afternoon. Saturday is market day on the main square, when you can see displays of the well-known Alentejo pottery. Estremoz is 60 km west of Badajoz, Spain. Bus service is available from Évora and Lisbon. Trains go to Estremoz on the Portalegre and Évora line, but there is no train service between Estremoz and Spain. Signposts lead up the hill to the castle. Not far from the Spanish border, on the way to Lisbon, is the picturesque whitewashed town of Estremoz. A drive through the narrow, winding streets up the hill into the old town, with its Gothic and Manueline houses, is a trip into the Middle Ages. At the top of the hill, the castle of Estremoz is adjacent to a great keep—a 13th-century marble tower some 90 feet high. Just inside the entrance is a stunning white marble staircase with blue-tiled sides that leads up to spacious hallways. The public lounge resembles a small museum of Portuguese furniture and art from the 17th and 18th centuries, with valuable paintings, tapestries, and ceramics. Individually decorated guest rooms feature period furniture, embroidered or painted decorations, and either four-poster canopy beds or elaborate carved headboards. Views are either of the interior courtyard, the town, or countryside. Rooms vary in size, with the larger ones located in a new wing. The dining room is in a great baronial hall featuring heavy wood chandeliers and high-backed chairs. Its high vaulted ceiling is supported by several marble columns. Local specialties and lamb dishes are featured.